The fix involves exporting the records contained in the files, deleting the files, and importing the records back into new files. To accomplish this, you will need a way to manipulate sqlite files. I recommend using the Sqlite Manager extension. In this example, I'm going to assume the permissions file is the one that needs to be fixed. The steps are similar for cookies and form fill history. 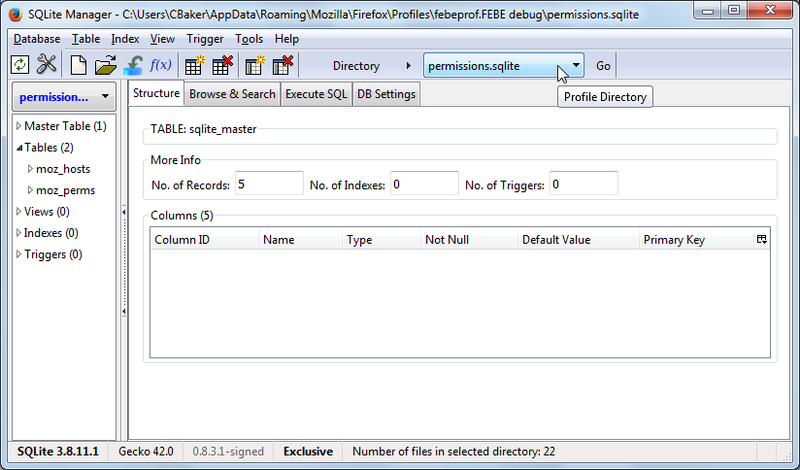 Open Sqlite Manager and select permission.sqlite located in your profile folder. Select Database > Export database and navigate to some directory you want to save to. Enter a name for the exported file (i.e., 'permissions') and click 'Save'. Close Firefox and open your profile folder. 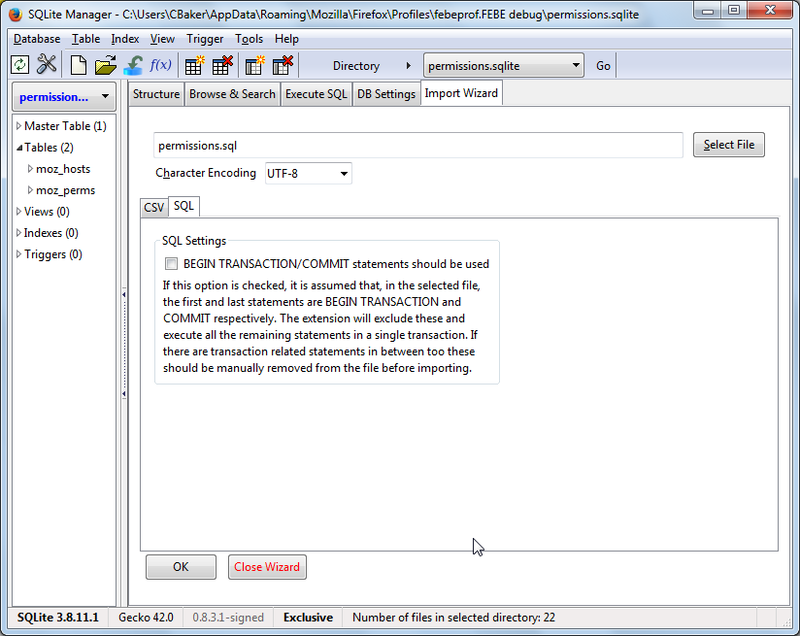 Open Sqlite Manager and select permission.sqlite again. Select Database > Import. Click the 'SQL' tab if it is not already selected. 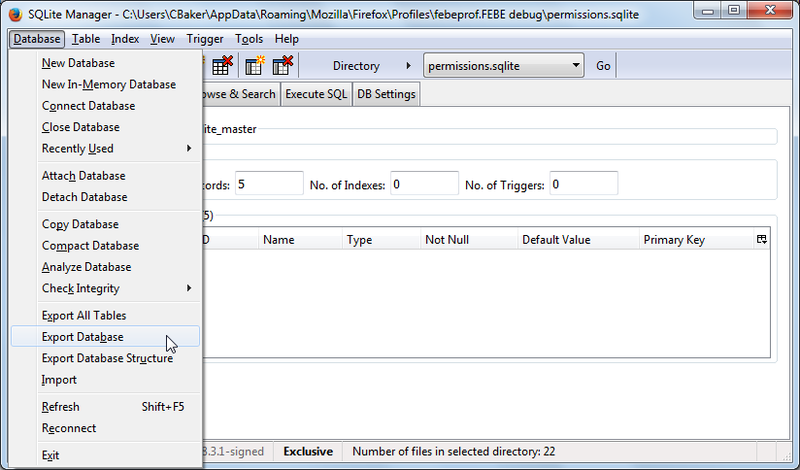 Click 'Select File' and navigate to your saved 'permissions.sql' file. Click 'OK'. Once the import is complete, you should be able to backup without the errors. Thanks Chuck, worked as advertised. Only thing was I tried with the formhistory.sqlite, and when I'd moved the file out into another folder and restarted, it did not recreate, but gave me an error. I then restored the original file and did the permissions.sqlite. This did work correctly and restore itself. After importing, normal FEBE function resumed. This was on Win7Pro, I'll try doing the same fix on LinuxMint tomorrow. Fri....LinuxMint 17.2 MATE fix worked as well, same thing, just the permissions. Thanks again. FF 43.0.4 Had problems saving permissions and form_fill. I corrected the permissions problem as above. Tested FEBE backup and both permissions and form_fill backed up Ok. Maybe there is a connection between the two. Anyway, did not have to do the process on form_fill. Yep ... Mozilla slips these little gems into new releases with little or no fanfare. I usually have to wait until the release goes public to see if FEBE is affected.